Most efficient way for restaurant and bar owners to get their after 5 specials to the people. The After 5 Specials web portal provides daily food, beverage and entertainment specials all in one easy to read listing. No need to click into each website to see compare the specials, just quickly scroll and read. Making plans with friends & family has never been easier. 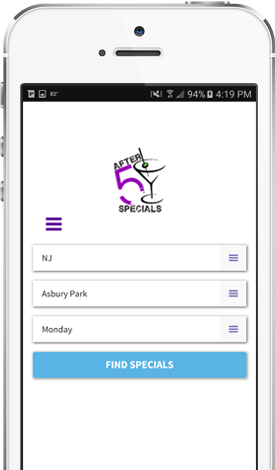 After5™ is an online portal for the public to find restaurant and bar specials by location by day. This comprehensive listing of food, drink and entertainment specials makes it faster to view the available deals for each day and zero in on your Consumption Destination. Just pick an area (eg., Asbury Park), select a day (e.g, Friday) and then view the available options. It couldn’t be any easier. Hot links inside the listing initiate driving directions automatically or dial the restaurant to make a reservation. Fun seekers no longer have to search the internet and read each website looking for the best place to go. Just like travelers don’t go to each and every airline and hotel website to find the best deals, After5™ is a central portal for food, drink and entertainment special offerings. Restaurants can set up their standard weekly specials for each day AND they can post each day’s dinner and entertainment specials. Restaurants can update their specials weekly or as often as they want, and it is as easy as typing an email. If Tuesday a slow day, change up the specials and see what happens. Are you specials falling flat, mix it up and see what happens. After 5 Specials is a fully responsive application, making it the available from a smart phone at the moment users need it. In a single list, you can quickly see the specials by area and scroll through them quickly and with one click launch driving navigation or a phone call to the restaurant. With only one click of the button. You will have all your local drink/food specials for your area that day. Just send us a message and we will start you on the process of becoming a part of After 5 Specials!